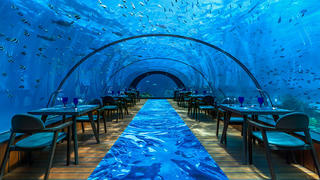 Located five metres below the surface of pristine turquoise waters in the Indian Ocean, just off Conrad Maldives Rangali Island, is the Ithaa undersea restaurant. Surrounded by vibrant coral gardens, diners can enjoy a panoramic ceiling of buzzing marine life while they enjoy a four-course lunch menu or a seven-course dinner menu. 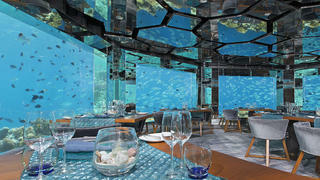 Look out for incredible dishes such as saffron champagne risotto, Maldivian lobster carpaccio and salty caramel sable. Ithaa can be booked for a private breakfast, weddings or other special occasions and is also open for mid-morning cocktails. If the idea of enjoying a meal beneath the ocean waves peaks your interest, then why not try counting fish instead of sheep at some of the best underwater hotels. Located five metres below the surface of pristine turquoise waters in the Indian Ocean, just off Conrad Maldives Rangali Island, is the Ithaa undersea restaurant. Surrounded by vibrant coral gardens, diners can enjoy a panoramic ceiling of buzzing marine life while they enjoy a four-course lunch menu or a seven-course dinner menu. Look out for incredible dishes such as saffron champagne risotto, Maldivian lobster carpaccio and salty caramel sable. Ithaa can be booked for a private breakfast, weddings or other special occasions and is also open for mid-morning cocktails. If the idea of enjoying a meal beneath the ocean waves peaks your interest, then why not try counting fish instead of sheep at some of the best underwater hotels. The centrepiece of the intimate Al Mahara restaurant is a floor-to-ceiling aquarium containing more than 30 different species of fish, which acts as a key feature in all the dining areas. In September this year, the Burj Al Arab Jumeirah Hotel (which is also home to one of the best luxury Dubai spas) welcomed Nathan Outlaw, a British chef specialising in seafood cuisine who has been awarded two Michelin stars in England. He has created sumptuous tasting, lunch and dinner menus, with alternative options for vegetarian and vegan diners. 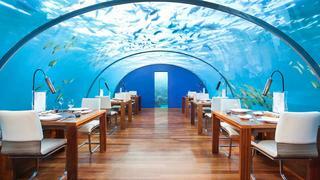 The restaurant features a number of private dining spots, all with a carefully designed underwater theme. Gold shell-inspired seating, wall detail with fish scale accents and striking coral-like lighting highlight the blue windows looking into the aquarium. The centrepiece of the intimate Al Mahara restaurant is a floor-to-ceiling aquarium containing more than 30 different species of fish, which acts as a key feature in all the dining areas. In September this year, the Burj Al Arab Jumeirah Hotel (which is also home to one of the best luxury Dubai spas) welcomed Nathan Outlaw, a British chef specialising in seafood cuisine who has been awarded two Michelin stars in England. He has created sumptuous tasting, lunch and dinner menus, with alternative options for vegetarian and vegan diners. 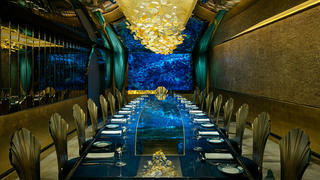 The restaurant features a number of private dining spots, all with a carefully designed underwater theme. Gold shell-inspired seating, wall detail with fish scale accents and striking coral-like lighting highlight the blue windows looking into the aquarium. The Hurawalhi Island Resort in the Maldives will be the ideal spot for those looking to dine among extraordinary marine life, as it's exclusive eatery 5.8 Undersea looks to be one of the best underwater hotel restaurants in the world. This incredible dining spot accommodates only 16 guests at a time for either breakfast, lunch or dinner. The menus include rich seafood dishes and indulgent alternatives such as Kobe beef and veal carpaccio alongside meticulous wine pairings. Placed by a heavy-lift ship 5.8 metres below the surface of the sea, vast panoramic windows and acrylic arches allow visitors to view the incredible Maldivian coral reefs teeming with wildlife, such as manta and eagle rays, tuna fish, sharks, parrotfish, groupers, eels, turtles and snappers. The Hurawalhi Island Resort in the Maldives will be the ideal spot for those looking to dine among extraordinary marine life, as it's exclusive eatery 5.8 Undersea looks to be one of the best underwater hotel restaurants in the world. This incredible dining spot accommodates only 16 guests at a time for either breakfast, lunch or dinner. The menus include rich seafood dishes and indulgent alternatives such as Kobe beef and veal carpaccio alongside meticulous wine pairings. Placed by a heavy-lift ship 5.8 metres below the surface of the sea, vast panoramic windows and acrylic arches allow visitors to view the incredible Maldivian coral reefs teeming with wildlife, such as manta and eagle rays, tuna fish, sharks, parrotfish, groupers, eels, turtles and snappers. If you're taking a break from ticking destinations off your diving bucket list on board your superyacht, enjoy your favourite tipples beneath one million litres of seawater at The Atrium Bar in the Radisson Blu Hotel, Berlin. The AquaDom is a vast free-standing aquarium that stretches 25 metres above diners and contains 1,500 tropical fish of more than 110 different species. 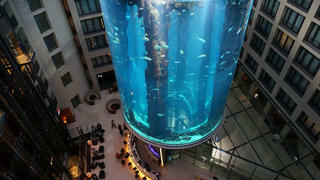 Visitors can get a closer look at the fish by travelling up the centre of the cylindrical aquarium in an elevator before sampling a delicious breakfast or during evening drinks at the Atrium Bar. Signature cocktails include the Blue Box, a blend of gin and blue curacao, laced with lime juice topped off with tonic or lemonade and the Piranha, which is a tasty blend of Gosling's rum, Angostura bitters, pineapple, orange, lemon and pomegranate. If you're taking a break from ticking destinations off your diving bucket list on board your superyacht, enjoy your favourite tipples beneath one million litres of seawater at The Atrium Bar in the Radisson Blu Hotel, Berlin. The AquaDom is a vast free-standing aquarium that stretches 25 metres above diners and contains 1,500 tropical fish of more than 110 different species. Visitors can get a closer look at the fish by travelling up the centre of the cylindrical aquarium in an elevator before sampling a delicious breakfast or during evening drinks at the Atrium Bar. Signature cocktails include the Blue Box, a blend of gin and blue curacao, laced with lime juice topped off with tonic or lemonade and the Piranha, which is a tasty blend of Gosling's rum, Angostura bitters, pineapple, orange, lemon and pomegranate. The Anantara Kihavah Resort in the Maldives is home to one of the first underwater wine cellars as well as a sommelier who will carefully create the perfect pairing to go with your meal. The SEA restaurant sits on the ocean floor and offers guests 360° views of local marine life from the edge of the reef, which is also on of the best scuba diving spots in the area. Various corals and sea fans cover the reef and sharks, turtles, triggerfish and trumpetfish can be seen from the window tables. The breakfast, lunch and dinner menus feature a varied spread of dishes from around the world with a focus on seafood dishes at lunch. Highlights include a Wagyu Beef Wellington, poached lobster medallion and red mullet filet wrapped in a lobster carpaccio. The Anantara Kihavah Resort in the Maldives is home to one of the first underwater wine cellars as well as a sommelier who will carefully create the perfect pairing to go with your meal. The SEA restaurant sits on the ocean floor and offers guests 360° views of local marine life from the edge of the reef, which is also on of the best scuba diving spots in the area. Various corals and sea fans cover the reef and sharks, turtles, triggerfish and trumpetfish can be seen from the window tables. The breakfast, lunch and dinner menus feature a varied spread of dishes from around the world with a focus on seafood dishes at lunch. Highlights include a Wagyu Beef Wellington, poached lobster medallion and red mullet filet wrapped in a lobster carpaccio. At the heart of the Oceanogràphic Park of Valencia lies the Submarino restaurant, which is set into the centre of a vast aquarium. The Mediterranean menu features an even balance of seafood dishes and Spanish delicacies, including Valencian paella, ox fillet with truffle dauphinoise potatoes and turbot with seaweed and nuts. 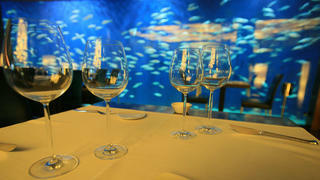 Guests can also choose beverages from an extensive wine list and dine at leisure while surrounded by more than 10,000 fish. 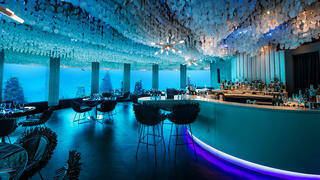 Tables are located beneath jellyfish-themed lighting with floor-to-ceiling windows in the circular outer walls and ocean-inspired interior design pieces. Visitors can hope to see starfish, clownfish, rays and sharks. At the heart of the Oceanogràphic Park of Valencia lies the Submarino restaurant, which is set into the centre of a vast aquarium. The Mediterranean menu features an even balance of seafood dishes and Spanish delicacies, including Valencian paella, ox fillet with truffle dauphinoise potatoes and turbot with seaweed and nuts. Guests can also choose beverages from an extensive wine list and dine at leisure while surrounded by more than 10,000 fish. Tables are located beneath jellyfish-themed lighting with floor-to-ceiling windows in the circular outer walls and ocean-inspired interior design pieces. Visitors can hope to see starfish, clownfish, rays and sharks. Six metres below the surface of the Indian Ocean lies Subsix — an elegant restaurant 500 metres off shore from the Per Aquum Niyama Resort in the Maldives. Accessible only by a speedboat transfer, guests of the hotel will be able to enjoy a champagne breakfast, a ‘subaquatic lunch’ of light seafood dishes or evening cocktails, making it a must-see for those exploring the Maldives on a luxury yacht. The themed interior accentuates the submarine atmosphere, featuring a clam-inspired bar, soft ‘anemone’ seating, a canopy of capiz shells and floor to ceiling glass windows with incredible underwater views. The surrounding reef is home to more than 90 species of coral and guests can hope to see hawksbill turtles, parrotfish, moray eels, groupers and butterflyfish among others. Formerly a nightclub, the space can now be booked for private own events, including weddings, wine tastings, marine biology tours and parties. Six metres below the surface of the Indian Ocean lies Subsix — an elegant restaurant 500 metres off shore from the Per Aquum Niyama Resort in the Maldives. Accessible only by a speedboat transfer, guests of the hotel will be able to enjoy a champagne breakfast, a ‘subaquatic lunch’ of light seafood dishes or evening cocktails, making it a must-see for those exploring the Maldives on a luxury yacht. The themed interior accentuates the submarine atmosphere, featuring a clam-inspired bar, soft ‘anemone’ seating, a canopy of capiz shells and floor to ceiling glass windows with incredible underwater views. The surrounding reef is home to more than 90 species of coral and guests can hope to see hawksbill turtles, parrotfish, moray eels, groupers and butterflyfish among others. Formerly a nightclub, the space can now be booked for private own events, including weddings, wine tastings, marine biology tours and parties.